Apparently I love to make shoes, there are so many easy fast and cute patterns that I can't resist. What I like most is taking a pattern and making it my own. 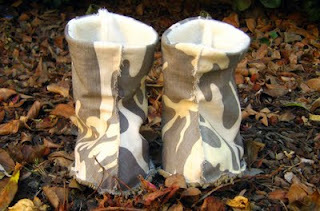 Found this boot on this cute blog, saved it a few months ago waiting for the time to use it....well my cousin had a baby boy and they live in a cold climate so....camo boots for baby Trevor.